ABOVE: Sch�nbrunn Park with palace. INSET PHOTO: Rooftop clock at Sch�nbrunn. Summer cottages have always been popular with wealthy Europeans, so it shouldn't have come as a surprise when Emperor Leopold I--ruler of the Austro-Hungarian Empire--commissioned a hunting lodge near the old Tiergarten, or Zoo, at Sch�nbrunn ("Beautiful Fountain") on Vienna's outskirts in 1695. What was surprising was the grandiosity of his vision: He ordered Bernhard Fischer von Erlach, the greatest architect of the Baroque Era, to design a palace larger than Versailles. Fortunately for the Austrian Treasury, the emperor balked when the architect's estimate came in, and the Habsburg family settled for a more modest dwelling with only 1,441 rooms. When Empress Maria Theresia ascended to the throne in 1740, she had Sch�nbrunn Palace expanded and redecorated in French Rococo style over a five-year period from 1744 to 1749. The palace was later occupied by Napoleon and surrendered to the Austrian Republic upon the abdication of the last Habsburg emperor, Charles I, in 1918. 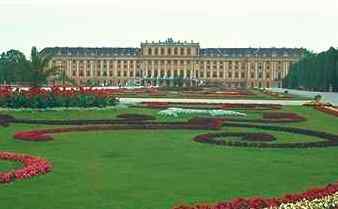 Today, the restored palace is both a national monument and an apartment house for a number of lucky Viennese. "Sch�nbrunn, the building of which was begun by the princes of the House of Austria, was the object of Maria-Theresia's particular affection. It was she who completed it, and, in order to accelerate the work, part of it was done by torchlight. The castle is delightfully situated on the right bank of the Wien. "The majestic ensemble of its architecture proclaims at at once to be a royal residence. The gardens, nobly and most gracefully planned, interpersed with sheets of limpid water skillfully disposed, planted with trees of the most luxuriant vegetation, and studded with the most precious marble and bronze statuary, harmonize most imposingly with the magnificence of the palace itself. "The park is alive with deer of all kinds, the peaceful tenants of those beautiful spots, and they, as it were, seem to invite the approach of visitors. Every day and at all hours these glades and avenues are open to the public. Numberless carriages and horsemen are constantly there. "The park is surrounded by pleasuances, the inmates of which in the milder season are the eyewitnesses of a succession of f�tes and rejoicings. The sound of those rejoicings pierces the wall of the imperial habituation, and adds by its animation to the charms of the noble pile." * Excerpt from Journal of a Nobleman is quoted from Vienna, by Frederic V. Grunfeld and the editors of the Newsweek Book Division, Newsweek, Inc., 1981, IBSN 0-88225-304-2.